February 28th is International Rare Disease Day, and it reminded me that I’ve been rather sporadic in updating this blog. That’s mostly because I’ve been working on rare disease analyses, publications, and grants. However, it’s motivated me to share a bit about my strategy for studying rare diseases with genomics and how my thinking has evolved in the past year. Our research study on the genomic basis of rare diseases has been running for about three years. To date, we’ve enrolled more than 200 individuals from about 65 families. A wide range of phenotypes are represented, including congenital malformations, developmental disorders, neuromuscular diseases, and other conditions. We’ve found a likely cause of disease or are pursuing a candidate variant in roughly 1/3 of the cases analyzed so far. Three of those were published last year, and several more are submitted or in preparation. This is consistent with the widely-established diagnostic yield (25-30%) for studies like ours. Our clinical laboratory has a similar diagnostic rate for WES cases. It’s daunting sometimes. We want to provide an answer for every family, but statistically speaking, we’re more likely to have negative results. However, there is value in both success, i.e. providing an answer, and in failure. Here are some key lessons learned. This sounds counter-intuitive at first, but it’s something that is quite apparent when working at a major children’s hospital. Any particular rare disease affects only a small proportion of the population by definition. For example, consider Rubenstein-Taybi syndrome, a rare congenital malformation syndrome with an estimated prevalence of 1 in 100,000. That’s pretty rare. Even so, at least three patients have been diagnosed with RSTS in the past couple of years at our institution alone. While individually rare, they collectively are a significant cause of medical conditions. Especially in children. Granted, there’s undoubtedly a selection bias: Kids with rare disorders are more likely to be hospitalized and be seen by a geneticist. Also, many genetic disorders cause chronic medical issues, which means we see them a lot more often than the average healthy kid. This probably makes them appear more prevalent than they really are. 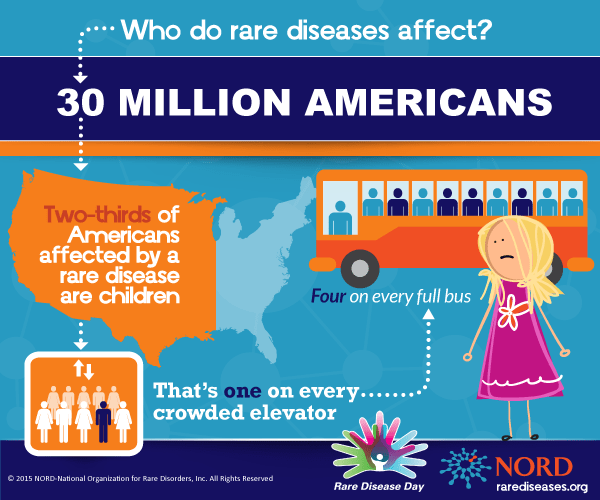 Even so, there are 30 million people affected by rare disorders in the United States alone. That’s about the same number as people with diabetes, one of the most common diseases. Many rare diseases, especially the well-studied genetic syndromes, have a “classic” clinical presentation. Clinical geneticists are taught to recognize patterns of human malformation that manifest in certain conditions. However, there’s a growing appreciation for the phenotypic spectrum of disease. In other words, not everyone with the same rare condition has the same set of medical problems (or characteristic features). Further, many of the genetic variants underlying rare disease have incomplete penetrance, i.e., not everyone with them gets the disease. This is why precise and thorough phenotyping is critical in our field. I don’t just mean the patient, but also parents, siblings, and distant relatives. Genetic diseases tend to run in families, and the family history often guides our approach to analysis. When it comes to pedigrees, the word “normal” is a dangerous thing. Sometimes it means perfectly healthy, but other times it means they haven’t come to medical attention as far as we know. Although de novo mutations account for a significant proportion of genetic diagnoses, many causal variants turn out to have been inherited from “normal” parents. This is especially true for rare disorders because the patients are usually few and far between. Back in September, I heard a wonderful talk by Dr. Kym Boycott of the Children’s Hospital of Eastern Ontario who is one of the leaders of Canada’s Care4Rare Consortium. That consortium has provided a genetic diagnosis for 1,500 patients and families, and discovered 135 new disease genes along the way. One of their keys to success? Data sharing. 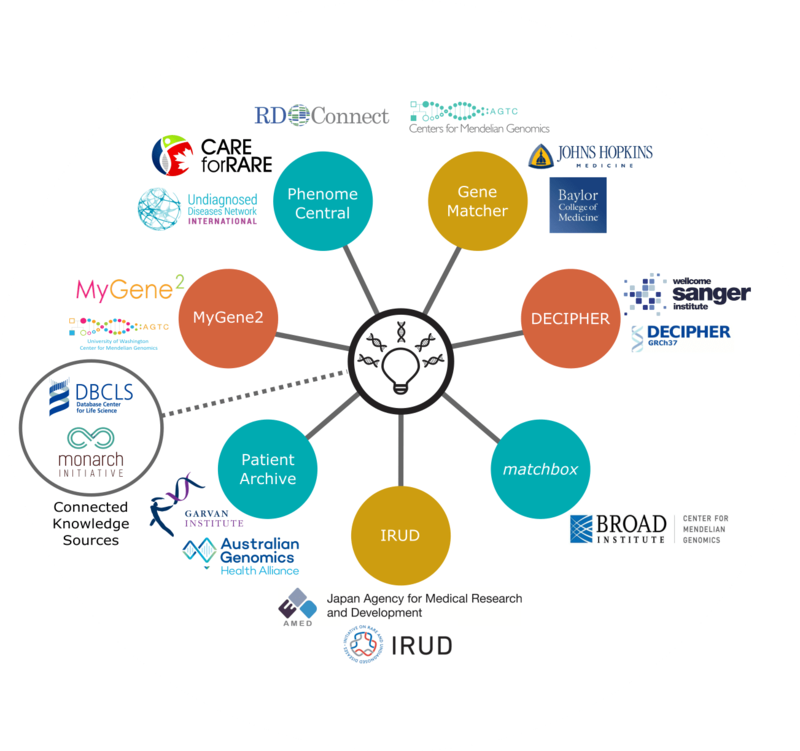 They share genetic and phenotypic data with other investigators via the Matchmaker Exchange (a free service that unifies GeneMatcher, MyGene2, DECIPHER, and other data sharing portals). Further, they make their sequence data available to any qualified researchers who want to have it. They share everything, which I suppose is not surprising since they’re Canadian. Dr. Boycott’s talk motivated me to start sharing our rare disease research data more systematically. We submit candidate variants/genes of interest to Matchmaker Exchange through GeneMatcher, and we submit variant interpretations to the ClinVar database. These efforts have already paid off; at least three of our rare disease cases now have a diagnosis because of data sharing efforts. With new genomics tools & approaches, we’re better equipped than ever to study rare diseases. Even so, sharing and collaboration are essential for the discovery and characterization of new disease genes. There are millions of people around the world counting on us. Let’s get to work. I’m arriving around lunch time, and plan to check in before heading over to the convention center for the ASHG Presidential Address. This is also the publication day for Putting the Science in Fiction, my nonfiction book with Writers Digest, so I’ll probably be huddled over my laptop most of the afternoon. In the morning, I’m splitting my time between two platform sessions: Variant Insights from Large Population Datasets (#6) and New Frontiers in Computational Genomics (#11). Late morning, I’m intrigued by two invited sessions: Achieving Genomics Literacy for the Masses (#15) and Uncovering Missing Heritability in Mendelian Diseases (#22). Over lunch, I’m going to check out the Congenica event on The Importance of Early Diagnosis in Rare Disease. After that, I’ll check out a lot of the posters and then spend the rest of the afternoon in Session #28, Sequencing-based Diagnostics for Newborns and Infants. That evening, The Ohio State University is hosting the Scarlet & Gray reception, so that’s a good place to find me. This is my busiest day. It starts with a coffee discussion on the Future of Pediatric Genomic Testing (session #28). Then I’m looking forward to platform session #44: Comprehensive Descriptions of Genetic Architecture of Rare Diseases. Leading off is Anne O’Donnell-Luria with an update on Mendelian gene discovery in over 22,000 families from worldwide populations. I’ve heard her before, and she’s fantastic. From 11-12:30, I’m moderating session #51: What are We Missing? Identification of Previously Underappreciated Mendelian Variants with Zeynep Coban Akdemir of Baylor. We have a fantastic lineup so I hope you’ll come out and ask some great questions (so I don’t have to). After that I’ll be gearing up for the afternoon poster session. Please come see me at 3:00-4:00 pm at poster 1108 in the Mendelian Phenotypes section if you’re interested in how research genomics expands the genetic etiology and phenotypic spectrum of rare pediatric conditions. Thursday evening, I’m participating in a special offsite event. Mysterious Galaxy, a well-known independent bookstore, will host an author panel on science and science fiction from 7:30 to 9:00 p.m. The panelists are four contributing authors to Putting the Science in Fiction, and we’ll be signing books afterward. Please come by, join the discussion, and support a fantastic local bookstore. There’s a lot of good stuff in the morning sessions. I’ll split my time between Session #68: Enhancers and Noncoding Regions and #69: Using RNA-seq to Improve DNA Sequence Interpretation. The late morning invited sessions seem… weird. There are no invited sessions featuring large-scale sequencing at this year’s ASHG meeting, which I find extremely disappointing. Especially since two such sessions were proposed but not ultimately selected by the Program Committee. I hope that they’ll do better next year. On the bright side, there look to be some interesting talks in plenary abstract session II, which will probably round out my attendance at ASHG this year. I’m scheduled for a flight home that night (coming back to Eastern time will be rough). So, that’s my schedule. Hope to see you in San Diego! One of the major challenges of rare disease genomics is the availability of patient samples. The disorders being studied are, by definition, rare in the human population, and the variants that cause them (usually) rarer still. When it comes to identifying and establishing truly novel disease genes — genes that have not yet been associated with disease in humans — the burden of proof is fairly high. One strategy for providing such proof is to show that the same variant, or variants in the same gene, segregate with disease in multiple unrelated patients. Of course, you have to find those patients first. This should be increasingly possible in an era of widespread exome and genome sequencing. Especially among researchers who are willing to collaborate and share data. A number of services have emerged that aim to connect patients, families, and researchers interested in the same candidate gene in similar phenotypes. The Matchmaker Exchange (above) acts as a centralized portal to query across GeneMatcher, DECIPHER, myGene2, and other such portals. Also, research groups such as the Centers for Mendelian Disease Genomics maintain up-to-date lists of the phenotypes and genes they’re actively pursuing. I was surprised to learn, while attending the Family Genomic Studies Workshop at OSU this week, that many researchers working on rare diseases weren’t aware of these resources. That’s why I’m highlighting them here, briefly. What I’d really like to discuss today, however, is the power of old-fashioned communication and collaboration. Shoe leather, in other words. The American Society of Human Genetics annual meeting takes place next month in San Diego. The abstracts are now online. Most attendees probably won’t bother reading them in advance, and I think that’s a huge missed opportunity. Here’s a story to illustrate why. I moved to Nationwide Children’s Hospital about two years ago, and began working with the already-in-progress Rare Disease Genomics Project. This was an effort to uncover the genetic basis of disease in children with rare, undiagnosed disorders who had exhausted all clinical testing. At the time, the project had already enrolled more than a dozen cases, and had some promising leads. One of them was a particularly memorable (and sad) pediatric case. The proband was a boy who was born with arthrogryposis (contractures of the joints) and a striking atrophy of skeletal muscle. He had a host of medical issues. Whole-genome sequencing had uncovered a de novo mutation in BICD2, a gene associated with spinal muscular atrophy of the lower extremities. But there were two problems. First, all of the reported disease-causing mutations were missense changes (in blue, below), but our patient had an inframe deletion (in red, below) that removed a single amino acid. Second, most BICD2 mutation carriers described in the literature had milder disease (than our patient), typically restricted to the lower extremities. We couldn’t reach a consensus, even internally, about whether or not we’d found the answer. Fast forward to about a year ago, when the abstracts for ASHG 2017 came online. ASHG doesn’t just make them browsable, but searchable. So I spent an afternoon searching for phenotypes and genes that came to our attention through the rare diseases project, to learn if anyone else was working on them. There was a poster describing a muscular atrophy patient who carried a BICD2 mutation. In fact, it was the exact same inframe deletion as we’d found in our patient. Thanks to the wonderful ASHG app, I bookmarked the poster presentation so I wouldn’t forget. At ASHG 2017, I found the poster during its assigned session and introduced myself to the lead author. She was an OB/GYN doing a fellowship in genetics. Basically, I wanted to first find out if we had the same patient, because sometimes individuals with rare disorders end up in multiple genetic studies (see ALS). But no, her patient was female and a few years older than ours. We exchanged contact information, and she promised to put me in touch with the PI. Our patients, as it turned out, had a number of features in common. It was enough to convince both groups that we had a pathogenic mutation. And over the ensuing months, other publications on BICD2 — including one report of a different inframe mutation — had expanded the set of associated phenotypes. Our collaborative paper, now online at Molecular Case Studies, supports the expansion of clinical features among BICD2 mutation carriers to include cerebral atrophy, seizures, dysmorphic facial features, and profound muscular atrophy. Sadly, as we were writing up the study, we learned that our patient had passed away. Our finding would not have presented this, but it still felt like a gut-punch. Even so, we had found an answer and helped add to the literature about BICD2 mutation carriers. I like to think that it illustrates the power of both stubbornness and collaboration when working on rare disease cases. Early infantile epileptic encephalopathy (EIEE) is a devastating syndrome of intractable seizures that strike in the first months of life. According to Orphanet, it affects 1 in 50,000-100,000 births. Infants with EIEE may suffer hundreds of tonic spasms per day, both during sleep and wakefulness. The prognosis is not good. Most patients die within two years; those who survive are severely impaired. Most cases of EIEE arise sporadically (i.e. without a family history), though autosomal recessive inheritance has also been reported. Clinical diagnosis can be challenging, since infantile epilepsy is also associated with certain brain malformations and metabolic syndromes. Genetic testing for EIEE is made challenging by the fact that upwards of 50 genes have been associated with the disorder (current gene panels test ~50-130 genes). Even so, 40% of patients tested by gene panel or exome sequencing fail to achieve a diagnosis. Earlier this month, a group at the University of Utah published a study demonstrating the power of whole-genome sequencing as a diagnostic tool for EIEE. Their cohort comprised 14 EIEE patients (recruited in 2015-2016) who had undergone extensive prior testing without receiving a diagnosis. The probands were tested, along with their parents, by deep whole genome sequencing (~65x coverage) and comprehensive variant analysis. One showpiece of this study is the bioinformatics methodology the authors employed to maximize their chances of detecting causal variants. They applied well-established tools to call SNVs/indels detector (GATK) and SVs/CNVs (LUMPY/SVtyper). Because they were particularly interested in de novo mutations — present in the child but not either parent — they also utilized a reference-free k-mer analysis algorithm called RUFUS to reveal sequences present in the proband that were not found in either parent, suggestive of a de novo event. This is important because most of the apparent de novo mutations identified by routine variant analysis tools (e.g. GATK) are not real: they’re either alignment artifacts in the child, or variants that were missed in one of the parents. 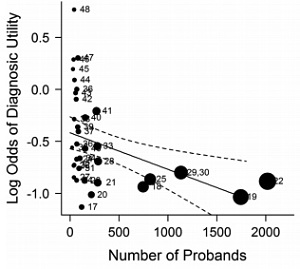 By performing a k-mer analysis, you avoid the former. It’s a cool idea, really. Wish I had thought of it myself. Notably, the first tier search returned a diagnosis — a pathogenic/likely pathogenic mutation in an EIEE-associated gene — for 10/14 subjects (71%). That’s close to the expected diagnostic rate, and thus not terribly surprising. What is a bit surprising is that three of these subjects reportedly had negative epilepsy gene panels prior to enrollment, which raises the question of how such obvious pathogenic mutations were missed. One case was solved in search tier 2, when the proband was found to harbor a de novo 63-kb duplication within CDKL5. The duplication was predicted to cause a frameshift and early stop, and it was on the X-chromosome (so hemizygous) in a male patient. ClinVar P/LP missense (blue), nonsense (red), and inframe (light blue) variants in DEAF1. As you may have noticed from the above, the p.G212S variant is already in ClinVar, as it was reported in a different patient with dominant intellectual disability and seizures. Another harbored a missense mutation in CAMK2G, which the authors propose as a novel EIEE gene. CAMK2G encodes the gamma subunit of the calcium/calmodulin-dependent protein kinase II complex, which plays an essential role in synaptic function. The missense variant is predicted to be damaging by about half of in silico algorithms (our lab would not apply PP3 here, but this doesn’t change the interpretation). There is one reported heterozygote for this variant in gnomAD, but read data are not available and in my opinion that’s within the margin of error. Missense variants in CAMK2G appear to be under constraint. Overall, a pretty good candidate. So now there’s only one case to solve, and for that one the authors plunge into search tier 4 (SVs not affecting EIEE genes), also called the bucket of crap. I have spent countless hours running down candidates in tier 4 for our rare disease cases with little to show for it. Unlike me, however, the authors of this study actually found something that may be relevant: a de novo balanced translocation between chromosome 2 (2p16.1) and the X-chromosome (Xq28). A 92-gene segment from chromosome X thus ends up on chromosome 2, where the authors speculate that X-inactivation may be disrupted, altering their transcription. Rett syndrome is a neurodevelopmental disorder that occurs almost exclusively in females. It is characterized by arrested development between 6 and 18 months of age, regression of acquired skills, loss of speech, stereotypic movements (classically of the hands), microcephaly, seizures, and mental retardation. Rett, a Viennese pediatrician, first described Rett syndrome after observing 2 girls who exhibited the same unusual behavior who happened to be seated next to each other in the waiting room. The patient in this study had microcephaly, seizures, and global delay, which are all prominent features of the Rett phenotype. I’d be very curious to learn if she also develops the characteristic hand movements. While not definitive, the fact that these alterations are de novo, and affect multiple highly relevant genes, suggests that these are somehow responsible for the EIEE phenotype. In the abstract, Ostrander et al write that “the detection of a pathogenic or likely pathogenic mutation in all 14 subjects demonstrates the utility of WGA.” If I wanted to nitpick, I’d argue that they have P/LP variants in 12 patients, since CAMK2G is not yet established as an EIEE gene and the causal nature of the chr2-chrX translocation in patient 2 is not established. More accurately, the authors have uncovered a P/LP variant or strong candidate variant in all 14 patients. The cohort in this study does not entirely represent clinical reality, particularly because only subjects for which both parents were willing and available to participate were included. That’s an ideal setup if one wants to pursue only de novo mutations. A patient with only one available parent (or no available parents) is a common situation in genetics clinic and would present considerable challenges to this type of analysis. Most geneticists recognize the power of WGS to comprehensively detect genomic variants, and to return those results relatively quickly. The cost of WGS, however, remains a significant barrier. Clinical WGS currently costs around $15,000 per trio, roughly twice the cost of clinical exome sequencing. 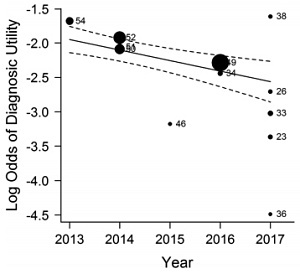 Yet, as Ostrander et al point out, the patients in this cohort underwent a minimum of 24 diagnostic tests, costing (on average) $30,866 per patient. Perhaps just as importantly, at least three of the patients in this study had undergone gene panel and/or exome sequencing which failed to detect a rather obvious pathogenic mutation. The authors did not explore this further, at least in the paper. Yet it emphasizes that WGS may provide faster and more comprehensive results as a diagnostic tool.